Typical fake news empty frocks. Bunch of hypocritical nobodys. About time someone exposed them. Anti zemach says: "Where's the intellectual honesty, folks? They're bringing all the "Mechablim" in America, Reb Elya Ber and Reb Malkiel.."
Hirshel, you're calling yeshivah faculty members "terrorists" is this the "intellectual honesty" you're calling for!? Chaim Berlin is not mainstream Yeshivish. They are now Satmar extreme controlled. The head rabbi in his frock along with his two nobody sons are a pathetic joke. Two beards with a frock. Literally zeros. It all started as a lo tzayis dina. Fruchtandler and the esteemed Schechter mishpachos had some really good "family" Jerry Springer worthy tzaros recently. 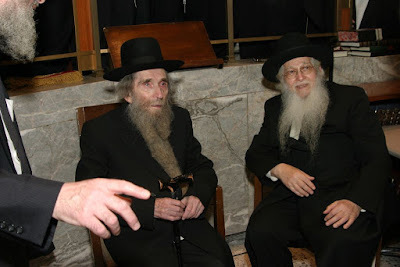 One can only imagine what their real punishment will be for what they did to Rav Carlebach years ago, or even worse -- how they ignored the Posek Hador, Rav Moshe Feinstein. Apparently they love openly trashing Gedolim. Rav Moshe was first. Then it became Rav Shteinman. What a bunch of baalei mechutzafim. They have a real hot place in hell waiting them. So if someone wants to be maspid a gadol they are thumbing their noses at leadership in EY? The facts are very simple. There is a machlokes whether to register for the draft or not. Some Gedolim say one way and some the other. Doesn't everyone have a right to choose a side in this argument? 2. 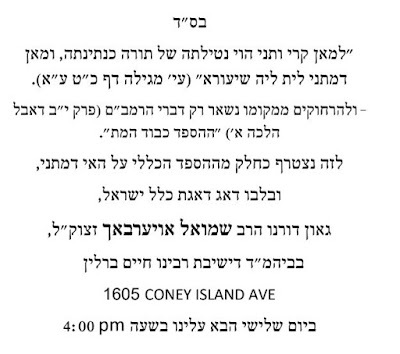 CB did not shlep him to speak there, his entourage requested to have him speak at all the large yeshivos in the area. It's about time that "the Tzig" gets back on the map! CB did Shlep him there. Schecter is on the Moetzes, when the trip was arranged by the Agudah. Stop denying the facts. And second, the point is that Shlechter has the audacity to say in PUBLIC in his wannabee Yeshiva, that his Yeshiva and himself never had any hashpa'ah from Rav Shteinman. Aha... so the Shmooze Rav Shteinman delivered in his Yeshiva doesn't count. You clearly are a Chaim Berliner. Schechter is a horrible person. This is Chinuch? Showing hundreds of Bochrim how to fight? What do you expect, the ראש הישיבה is a Vizhnitzer. Hey Hirshel, you should like MYRCB, after all, they host the spiritual leader of a local Lubavitcher shtiebel in their kollel. Or maybe you are not aware of it up north. The spiritual leader of Beis Menachem Mendel of Ave. J. Do you think that would have happened in the days of Rav Hutner z"l? The greatest days this blog has ever seen is when you had good CB reyd.... Threads with hundreds of comments, and some really interesting discussions. to them too? This could be a issue with my internet browser because I've had this happen previously. הרשע הראשון שקרא למקנא קנאת השם בתואר "מחבל"
Great photo of Schechter and the gadol hador. Schechter licking up the kavod that rav Shteiman ran away from his entire life until the last breating monent. Just look at his tzavah. Wanted 18 people at his levaya. The comment above about the Jerry Springer material in the Schechter-Fruchthandler relationship is 100% what I was thinking of. If you are mevazeh the Torah, you will be done the same to you. Kida kineged midah. Hashem is not a shosek on bizuy talmidei chachomim. See the gemara. Rav Moshe was mevuyash. Rav Shteinman was Mevuyash. God doesn't take that lightly. I'd be worried if I was a Schechter or a Fruchthandler. The chief Frock publicly humiliated a supporter of the Yeshiva. He recently pledged a few hundred grand and had since pulled his pledge. This is 100% true. Check it out. and you guys are calling the Satmars haters? shame on you talking trash on each other? the hoods in the Barrios have more class.feh. What a bust. Schechter spoke for 30 seconds then say down. Elya Ber never showed up. Asher Kalmanowitz utter shtusim about zero. Malkiel Kotler ranting and screaming about how RSA was the ONLY one who fought the Tziyonim and Giyus Banos. Not a word about his hasmada for 90 years. Not a word about the 5000 Yesomim he married off.... good job Kotler. Hater. And the Mechabel from Bnei Frock talked like the typical shoita. Utter nonsense from Markowitz. Good job Chaim Berlin! Once again removed themselves from the mainstream Bnei Torah crowd and into the Neturei Karta camp. And CB Had always a lot in common..
Wow 222 comments! Your almost making into the big leagues Tzigelberg! You might even reclaim your days of glory!! For the sake of accuracy, Rav Schechter did not say that there will not be a hesped for RALS because he had no hashpoeh on the Yeshiva. He said that although he had no hashpoeh on the Yeshiva, he did have a hashpoeh on many people, therefore "Yehi zichro boruch". 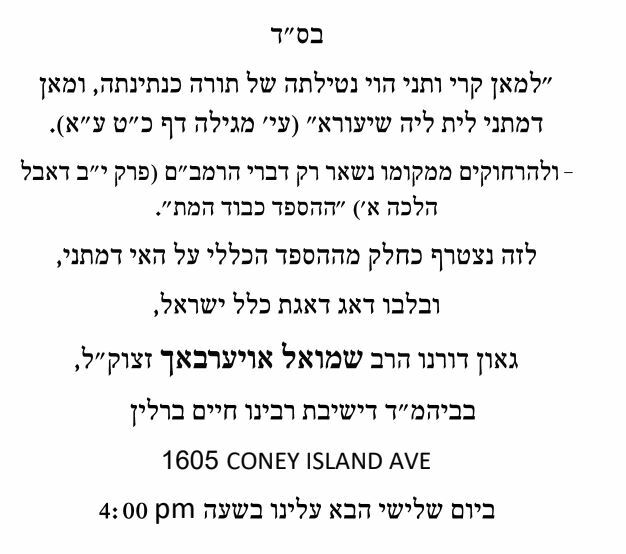 Why did the Yeshiva hold a hesped for RSA and not for RALS? Because RAS held of RSA and didn't hold of RALS. For the record, it is clear that RAS does not hold of Reb Ahron Leib; that was the gist of his statement on the attached audio. The fact that he had to repeatedly stress same, publically, immediately after the petirah, is "hilchos deyos" at its finest. Globally, the fact that the hilchos deyos clan are clearly incapable of appreciating the maylos of Reb Ahron Leib is disturbing as well as "katnus" (in their parlance). My point was that the hypocrisy charge is unjustified, because the reason for hesped/no hesped was not influence/no influence. It is clear that RAS does not like RALS ("the guidance he gave was 'mainly' good) and that is obviously the reason for no hesped. Leiby. You are right about the no hesped for Rav Steinman. Yet, I suspect that the kovad for Reb Shmuel has political undertones. "Kovad" etc., which traditionally have been admired by us. Hold on, just a little bit longer, the Chortkover Rebbe is on the way!!!!!! MBD, HEY WHAT ARE YOU SAYING???? NO MORE CHORTKOV PLEASE-IT FINISHED VERY NICELY 60 YEARS AGO, I HOPE NO MORON WILL COME AND MESS UP A CHASIDUS WHICH STILL HAS A GOOD NAME. HIRSHELE, Please be able to except other opinions besides yours. Rav Averbuch was minimum as big as Rav Shteinman (and in nigle v nistar pashtus he was much more).I did not see too much haspeidim by Rav Shteinman people on Rav Averbuch. Another nekuda-word "machbalim" was made up by Shaulson-not a goog rebbe, HIrshele. Good response in return of this query with real arguments and telling all about that. Chaim Berlin never in history made a hesped for anyone before. Not Rav Shach. Not steipler. Not Rav shlomo zalman. Not Rav elyashiv. Not Rav moshe. Not Rav yaakov. Not Rav ruderman. Not Rav Shmuel Berenbaum. Not Rav schneuer Kotler. Not Rav Elya svei. Not Rav Shteinman. No one. Never. Schechter never met RSA in his life. Never spoke two words for him. And he is making it like he was the manhig of yeshivos. This is a filthy disgusting game of politics that Schechter engaged in. The rooster will come home to roost. Bring markowitz into a Yeshiva and the chaim Berlin Bochrim will go down a very slippery slope. Schechter should be ashamed of himself. And Fruchtandler right up there with him. nice!got mechalelei Shabbos down her..
H: "They're bringing all the Mechablim in America"
are you deft, dumb, and blind? ¶ Survey: Only 46% of Next Generation National "Religious" Israelis Keep the Faith. May 16, 2017. So what's he playing at? Acting the biggest armchair kannoi for fun? mush: "Schechter never met RSA in his life. Never spoke two words for him. And he is making it like he was the manhig of yeshivos." What a farce. Did Rav Shach ever meet the SR? your loss maybe someones gain.. don't pain over it so much, at least don't show it.